Ray is a long-time friend of Bicycle Retailer and writes occasional columnsm blogs and articles for the website and magazine. 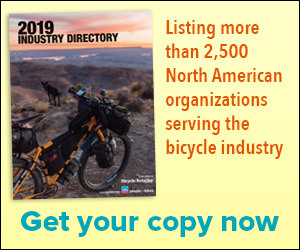 Ray's background includes stints as a bike retailer, executive director of the Bicycle Industry Organization, editor of a trade magazine, founder of Growth Cycle and now executive director of the Bicycle Product Suppliers Association. WILLIAMSVILLE, N.Y. (BRAIN) — It's a frequent, obvious, and frustrating question from anyone trying to get a handle on our industry: "Just how many bike shops are there in the U.S.? And how fast is that number shrinking?" Is the number of shops shrinking? There’s indication - and we don’t blame you if you are skeptical - that the number is increasing. SCHAUMBURG, Ill. (BRAIN)— As the CABDA Midwest trade show opened here Wednesday, BRAIN's intrepid reporter Ray Keener chatted up the attending retailers, asking about their hopes and fears for the 2019 season. DEL MAR, Calif. (BRAIN) — On the second and final day of the inaugural CABDA West trade show, BRAIN contributor Ray Keener asked retailers, "What's in store for 2019?" Spoiler: "E-bikes, lots of e-bikes." The industry veteran seeks to debunk myths on participation, advocacy and the danger of cycling. A blog by Ray Keener. Ray Keener: What's a trail? At great perceived personal risk, Keener wades into the "e-bikes on trails" debate. Ray Keener: Flat is phat? Are flat sales and participation really, "The single biggest issue facing the bike industry?" What's life like with an e-bike in the stable? If I Owned a Bike Shop, what three retail lines would I be drilling into my staff’s heads at this point?